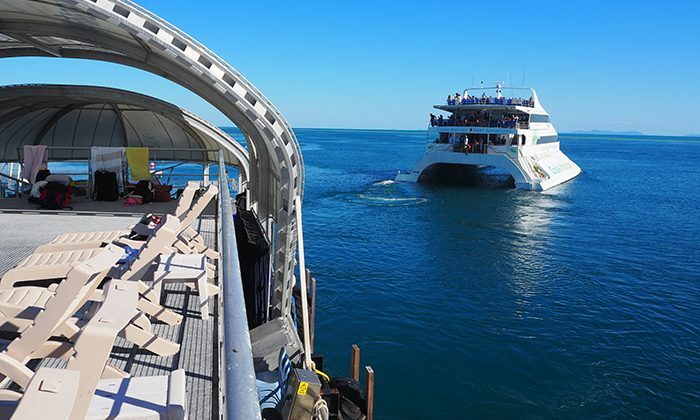 At 3pm, a Cruise Whitsundays ferry departs the company’s 45-metre permanently anchored pontoon, leaving two-dozen lucky passengers alone with the Great Barrier Reef. 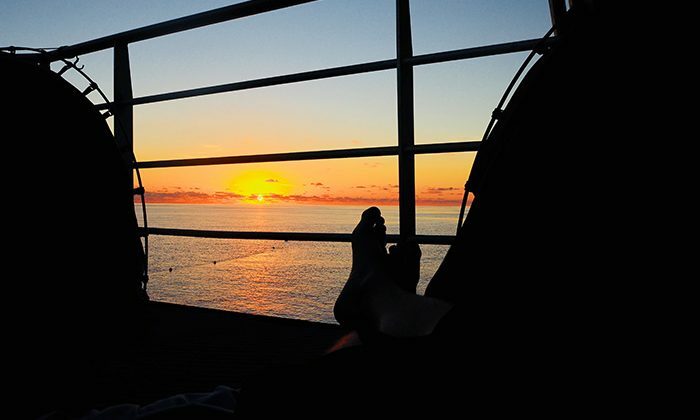 Now you can snorkel alone with abundant marine life, toast a magical sunset, devour a gourmet meal, and sleep in swags on the upper deck under the bright Milky Way. 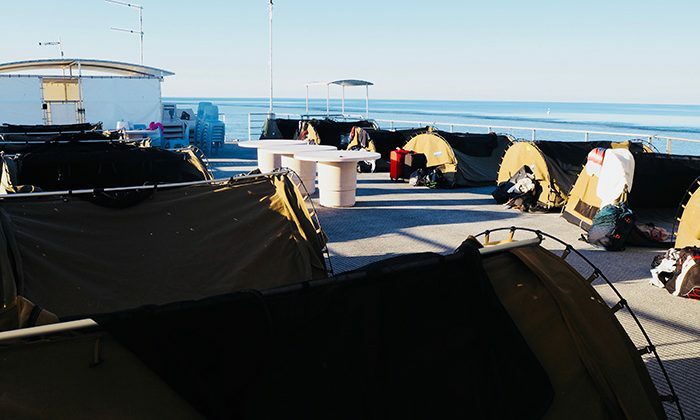 The crew take care of your every need, and with hot showers, mattresses, and flush toilets, it’s a comfortable, exotic, and especially romantic place to spend the night. Length of Trip : 2 days, departing in the morning and returning late afternoon the following day. Click here for the latest Reefsleep prices. 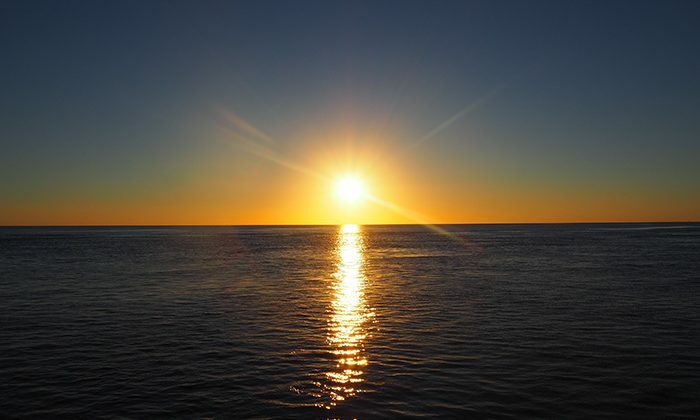 Best time to go : September provides sunny days and the least expected rainfall, with temperatures around a maximum of 26°C. Family friendly : Children must be 12 years and older to do Reefsleep. A sous-vide dinner is served onboard the pontoon, with guests choosing from various dishes beforehand. Breakfast is served in the morning. 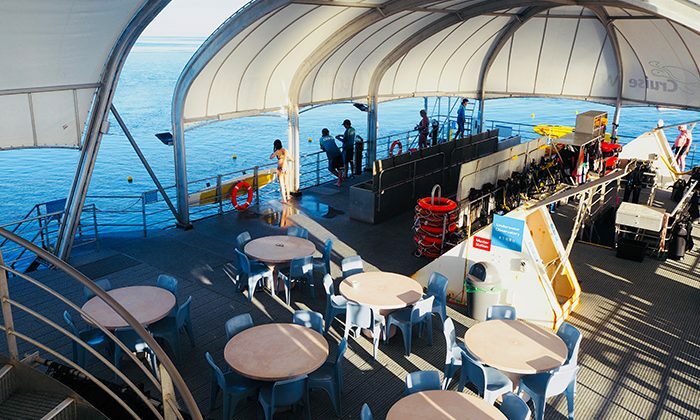 A buffet lunch is served on the catamaran. 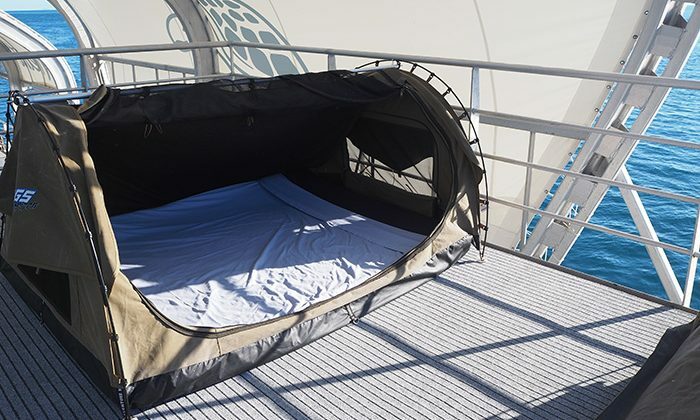 You'll be sleeping on single or double swags in the upper deck. A swag is a low tent with a clear viewing panel above your head, a comfortable mattress and snug bedding. Reefsleep supply double swags which can be used for two people sharing or by just one person. The swags are waterproof, but on a clear night and with no bugs to worry about, you can sleep under the stars with the cover open. 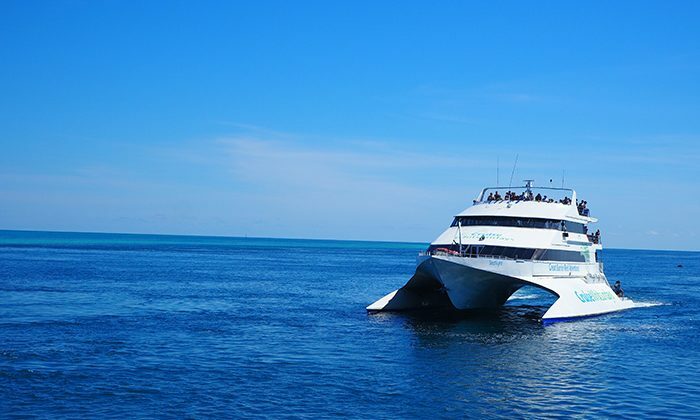 The catamaran departs Port of Airlie at 8:00 AM (Hamilton Island at 9am) and returns 6:10pm (Hamilton Island at 5pm) the following day. Coach and shuttle pick-up is also available. 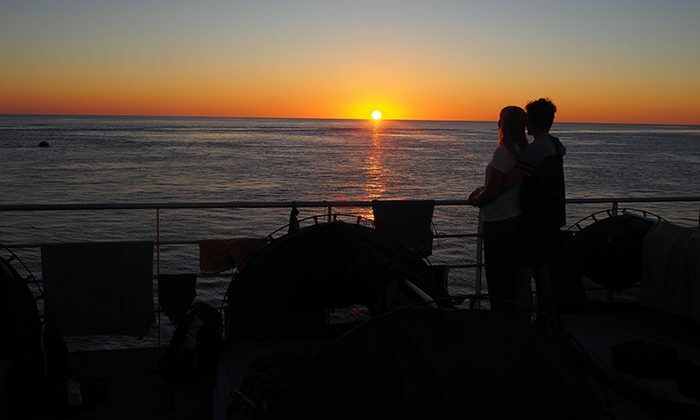 Our small group of international reefsleepers cracked open beers and chilled white wine for a magnificent sunset on the upper deck. 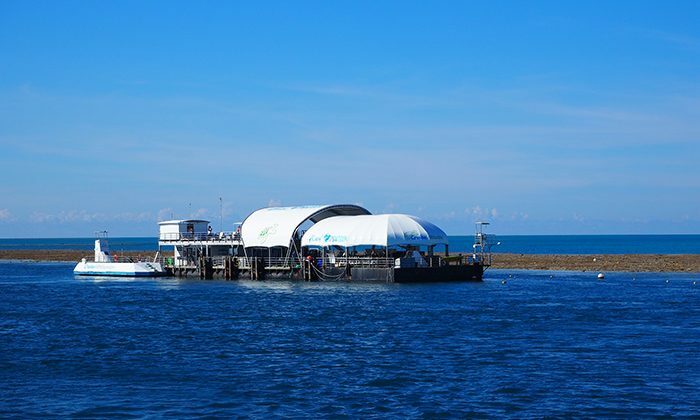 Dinner consisted of lamb shanks, steak, or seafood, all of which is remarkable considering it is served 90-minutes offshore, floating above the remote outer barrier reef. When the planets and stars begin to pop above our heads, it’s impossibly romantic. I retired under the Milky Way in my swag and woke up at dawn to see a perfect egg-yolk sunrise at my feet. 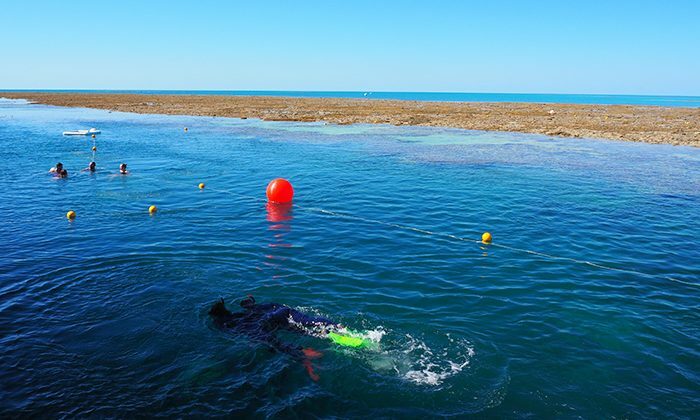 Does Reefsleep belong on The Great Australian Bucket List?